Children whose parents are active parishioners and have received their First Communion are asked to act as Altar Servers and assist during masses every weekend. The Choir is a group of individuals called by God to use their gift to minister the gospel of Jesus Christ through song. The primary purpose of the Choir and the Music Ministry at St. Columbanus is to bring individuals into a relationship with God and to help create an atmosphere during worship whereby the Holy Spirit can minister to the needs of His people. The primary purpose of the Extraordinary Ministers of Holy Communion is to help the priest administer the sacraments of holy communion. 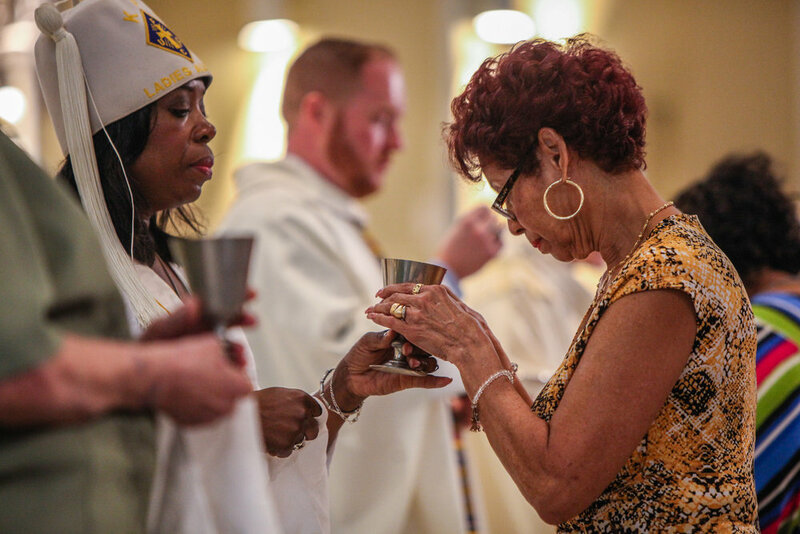 Extraordinary Ministers of Holy Communion are chosen and expected to participate in a training once a year to maintain their certification. "When the Sacred Scriptures are read in the Church, God himself speaks to his people, and Christ, present in his word, proclaims the Gospel. Therefore, the readings from the Word of God are to be listened to reverently by everyone, for they are an element of the greatest importance in the Liturgy." Lectors are chosen and expected to participate in regular trainings in order to maintain their role within the Parish. Responsible for assisting parishioners to their seats and offering additional assistance when needed during all masses.